Visits: 33366 persons viewed this recipe. 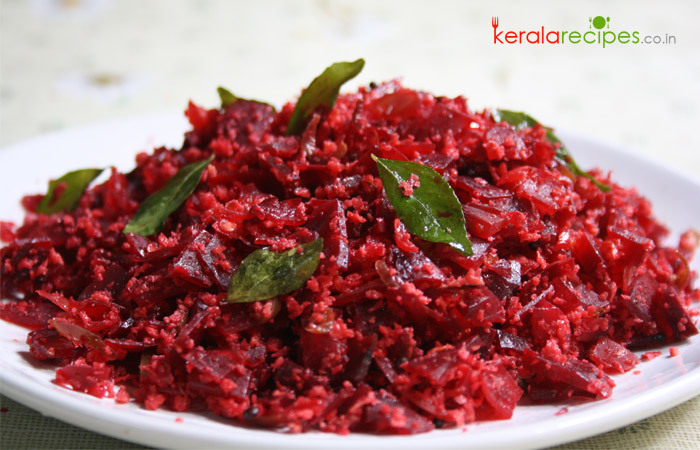 Beetroot thoran, a colourful and nutritious side dish for rice. Try this quick and easy recipe and please post your comments. Peel and grate/chop the beetroot finely. Slice the shallots. Grind grated coconut, garlic, green chilli and turmeric powder coarsely without adding water. Heat 1½ table spoon cooking oil in a non-stick pan and put mustard seeds. When it splutters, to this add shallots, curry leaves, chopped beetroot, ground mix, salt and a little water (2 table spoon). Combine well and cook it covered (about 6-8 minutes) on low heat till done. Don’t forget to give a stir in between. I am a just starting to learn how to cook and these are simple easy recipes!!!!! love it……… do post some more! Hi Binsi, Thanks for the feedback. I will be posting more easy recipes in the near future. Nice way of presentation and good recipes. Kindly include more pure vegetarian dishes. Hi Priya, Many thanks for your words of encouragement. I will try to post more veg recipes in the future. I tried your recipe for beetroot thoran and aviyal and my family really enjoyed both. Just wanted to say ‘thank you’ for sharing your lovely recipes. Hi Ahila, It is pleasure to see the listed of items you tried, thanks a lot for sharing your feedback. Nice to know that you all enjoyed it. Adipoli cooking. Nice photos really mouthwatering. Hi Beena, Thanks a lot for your kind words. My children hate beetroot. Let me try your thoran and I will let u know. Hi Gracy, Thanks for the comment. Hope it will work out well for you and your children will like it. Hi, Tried your recipe and really liked it. Your website really helps me specially to get the proper Kerala taste. I am in UK and will be having Kerala Curry Dinner Party. I want to cook your Beetroot Thoran recipe for 8 people as a side dish. Please advise how many people your recipes would feed, 2, 4, 6 ? Also, you give a quantity as 3 Nos or 4 Nos and I would like to know what this is as a measurement or quantity? Also, you state “a sprig of Curry Leaf” but as I have never seen how big a sprig is and can only buy these as single leaves in a jar, please advise me how many individual leaves to include. I look forward to hearing from you. Pat Robinson, Sorry to confuse you. The above mentioned recipe can feed 3 people comfortably. A large beetroot may weight about 250 to 300gm. One sprig of curry leaves may contain 10 to 12 leaves. Hope it will work out well for you. Thank you. Hai, Shaan Geo, Now I am living in Jeddah. I have no idea for cooking. But, still I am a good (not very well) cook because of you. Thank you so much and I am waiting for more easy recipe.